I installed the demo version of Re# 4 in my VS2008 and was working fine then I updated my XP to SP3 and now Re# displays as (Not loaded) when you go to Help/About and most of the menus are grayed. In the Add-in manager Re# does not display as an add-in. Do you know what should I do? Did you ever get a solution to this problem? We recently managed to solve the problem, at least for many other people. IR> Did you ever get a solution to this problem? I have read all the forum posts on this topic, I have uninstalled/reinstalled everything too many times, I have read the blog concerning MSXML, and I am incredibly frustrated. This product costs so much money, I mean, it was _very_ painful to get the higher-ups to shell out the bucks for it. I am unalble to get the add-in to load. I have been putting off posting to this forum because I need this now, not later, but at this point I would just like my VERY expensive product to work...just working would be great. Please contact me to help me get this working. Do I understand correctly that regsvr32 msxml6.dll completed successfully on your machine, but ReSharper still doesn't load? 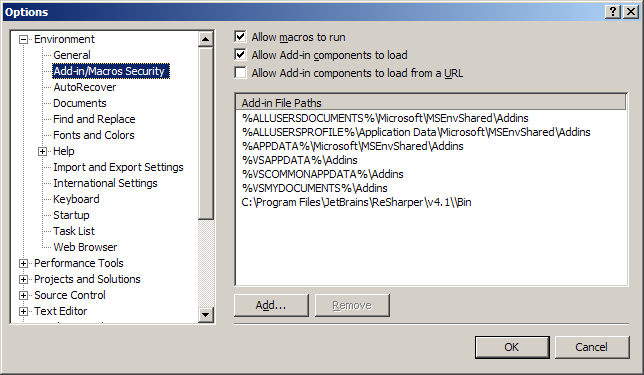 Is the path to ReSharper installation listed under Tools > Options > Environment > Add-In/Macros Security? You are correct. The MSXML trick does complete successfully, but ReSharper 4.1 still does not load. I have attached some screenshots. When I load up Visual Studio, I do not get prompted to enter my license key, and ReSharper never shows up as loaded in the "About" box. Is there anything else I can send you that will help? Can you set up a time to chat with me? We can fix this in real time? Hoping to get this resolved within a week or less. Think that will be possible? of ReSharper there, then reinstall 4.1.
appropriate 32bit compatibility node (VS is 32bit application). I'm sure you've tried this already, but just in case you haven't, have you tried checking the first and second checkboxes in " AddinManager.png (11.2 K)" then restarting VS? I am using Windows XP 32 bit. I've attached a screenshot of my registry. I don't see anythign that says ReSharper 3.1, yet it is still in the Add-in Manager. Is there a time, way we can chat in real time to work this out? 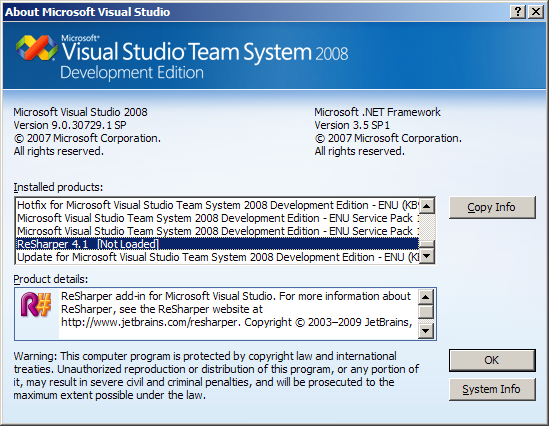 The file "Product.VisualStudio.90.AddIn" (path: C:\Program Files\JetBrains\ReSharper\v4.5\Bin\) didn't have permissions. I set owner Everyone for this file and set security "Full Control" for this user. Now ReSharper 4.5 is working! Files folder has read-only access for all the users on regular systems. The ReSharper didn't available in Add-in Manager. I tried fix it a lot, but nothing could help. I think that the system does not have enough priviledges to write information into the file. 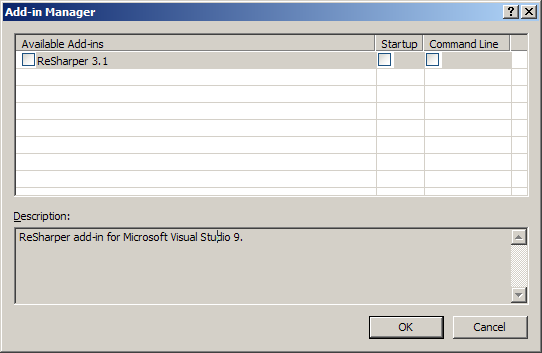 Tne owner for file "Product.VisualStudio.90.AddIn" was SYSTEM and file didn't have read-only access. I changed the owner and after that file was modified! This problems appear after I reinstaled OS. privileges for writing to Program Files on a normally configured system. Files location are assigned to the user groups and not the CREATOR OWNER. and file didn't have read-only access. for which the read permissions are also needed.